Brush after every meal- it is always best to brush following every meal so you can keep food off the teeth. This is can be difficult during the holidays with everyone running around and with the seemingly endless snacking and eating. If you cannot brush that often at least rinse with fresh warm water as often as possible between brushings. Avoid the sugary foods- the holidays are full of tasty treats like cake and pie and candy. These can seriously damage teeth in both the short term and long term, so it is best to avoid them and limit your consumption as much as you can. 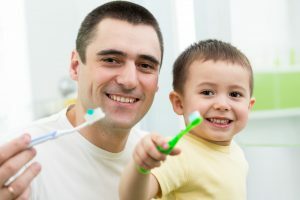 Maintain a schedule- it is difficult at times, but if you can keep to as regular a schedule as possible during the holidays it will make it that much easier to keep up with normal dental hygiene care. Dental care during the holidays is just as important as shopping for present and preparing the holiday feast! Don’t put off an emergency- no one wants to spend part of their holidays in the dental chair with an emergency filling, crown, or extraction. This may be true but it is better to get it taken care of now than to put it off and suffer through the entire holiday or risk worse problems down the road. When it comes to dental care during the holidays, we know how important it is to stay on top of good dental hygiene; if you are looking for help with dental care this holiday season, our local dental care team is here for you! Call today for any emergency dental needs you have or if you have questions about taking care of your teeth this holiday season. We would love to speak with you!